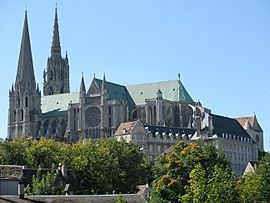 Chartres is a French commune in the Eure-et-Loir department. About 39,000 people live there. The Church of Saint Aignan. 17th-century engraving of Chartres "skyline"
Chartres Facts for Kids. Kiddle Encyclopedia.